Baby Chicks arrive at Ark Country Store February 6th and March 6th! For information on individual breeds available, see below. Please Note: Chick types are not guaranteed. 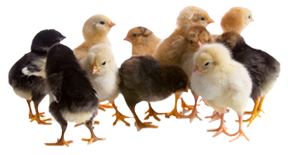 Please call the store at (972) 937-8860 to ensure which chick types are available before heading over. The hatchery can make changes, or a hatch can be short, so please call first. We are scaling back on the chicks we will be offering this year compared to past years, so make sure to get your chicks early! Now is the time to start your backyard flock. Chick starter kits, chick feeders, waterers and chicken feed are all available at Ark Country Store in Waxahachie and Midlothian. Stop in today to speak with our chick experts to get everything you need to raise a healthy flock! This entry was posted on Tuesday, January 16th, 2018 at 1:28 pm	and is filed under Events, News & Updates. You can follow any responses to this entry through the RSS 2.0 feed. Both comments and pings are currently closed.